Community/regional collaboration, where stakeholders in a given region need to co-ordinate collective action to address a regional sustainability issue. Industry sector/ value chain collaboration, where industry players need to collaborate on environmental and social challenges that could threaten the viability of the industry. Issue-specific collaboration, where a range of stakeholders come together to advance change on a particular sustainability issue. Whatever the scope, a suitable project is one where the nature of the challenge is such that it requires trust-building amongst players who have not worked together – or worked well together - before. There are currently five active Sustainability Transition Lab projects; Energy Futures Lab, Natural Capital Lab, Future-Fit Business Benchmark, the Greater Toronto Area (GTA) Housing Action Lab, and the Sustainability Literacy Lab. Each of these projects is very different from the others in scope and focus and at a different stage of development. While these active projects are the primary focus for The Natural Step Canada currently, we are actively developing other Sustainability Transition Lab project ideas and are always open to discussions about new project ideas with prospective partners. How can Canada’s leadership position in today’s energy system serve as a platform for the transition to the energy system that the future requires of us? The goal of the Energy Futures Lab is to shift the public narrative around energy from arguments that pit “us vs. them,” “jobs vs. environmental protection,” and “community health and well-being vs. resource development,” to new conversations focused on outcomes and a strategic transition from today’s energy system to one that is fit for the future. Learn more. The Natural Capital Lab is a platform for innovating and experimenting with new frameworks and approaches to valuing Canada’s natural capital. It is a collaborative effort that will build on existing domestic and international thinking. Phase 1 will explore the issue and validate assumptions, alternatives and appetite among key stakeholders to participate in the Lab. Phase 2 may commence in 2015 and focus on prototyping pan-Canadian approaches to valuing natural capital that protect and enhance our natural capital while driving innovation for the future. Learn more. The Ontario Circular Economy Lab (CEL) brings together private and public sector leaders and innovators from across Ontario to generate, test and implement circular economy solutions. Over the next four years CEL will provide a platform for ongoing experimentation, innovation and collaboration leading to tangible breakthroughs that accelerate Ontario’s transition to a circular economy. Convened by The Natural Step, CEL’s first program (Oct - Dec 2016) has brought together twenty-five influential leaders from different sectors and value chains in a Rapid Lab to develop a shared vision for the future of paper and packaging materials in a circular economy. Learn more. The Future-Fit Business Benchmark offers a set of performance criteria that describe a company that is fit for the future: one that will flourish while adding to the wellbeing of society as a whole. This is a collaborative, open source initiative co-led by The Natural Step Canada and 3D Investment Foundation. Learn more. 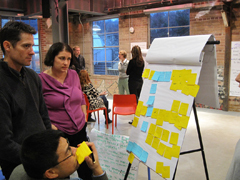 The Sustainability Literacy Lab aims to engage a network of Canadian stakeholders, including diverse voices in education, sustainability, engagement practices, decision-making, behavior change and other relevant topics to deeply consider, collectively design, and incubate a set of collaborative projects to forever change the way decisions are made in Canada. Learn more.